My life changes June 1st. Well, kind of. My lease starts that date for my apartment in New Paltz. So long dorm life! During my search for the perfect college, I wanted to make sure the dorm rooms were a decent size for me to live in for 4 years. Now that’s not even a concern. It is extremely common and more likely for students here to rent a house or apartment after their first year instead of staying on campus.Like I’ve said in my previous articles, the university is right in town so the walk to class or food isn’t much of a difference from the dorms. This upcoming semester I am renting this apartment with 3 other of my sorority sisters I just recently joined with. It’s located just a block from Main Street – which couldn’t get any better for a few reasons. This means an extremely short walk from the bar, which also means plenty of people are going to be crashing at our apartment. 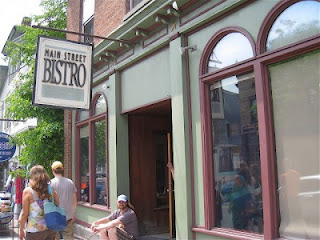 I also couldn’t be any closer to some of the most delicious places to eat in New Paltz. Jack’s Meats and Deli has the best turkey, lettuce and egg sandwiches hands down (if you haven’t tried them by now, please, get on my level). Bistro is up the road as well. $1.95 breakfasts, stir fry eggs, breakfast burritos. I could eat at Bistro every day. The apartment is also a building over from The Bakery. I’ve only had coffee and pastries there but I’ve heard from many people that they also have awesome, inexpensive sandwiches. As amazing as the restaurants in New Paltz are, one of the major reasons I wanted to move off campus was for my own kitchen. I’m actually looking forward to cooking my own meals instead of paying almost $10 for every small, unsatisfying meal and having trouble finding a place to eat on campus at awkward hours of the day. It may be a little bit of work, but it’ll be way cheaper than the campus meal plans and my friends and I can have “family” dinners from time to time. Living off campus it’s not uncommon to still have to share a room. But the 4 of are lucky enough to each have our own rooms. That definitely takes away the majority of my stresses. I’ll still just be a few steps away from my best friends, but I’ll have my own space, as well. When I go to bed, I won’t have to settle any noise or light issues. The bathroom is going to be shared between only 4 girls, not a whole floor of them. I can watch TV when I want to. And the best part yet: the 4 of us actually know how to keep a place clean. The only thing I’m not looking forward to about my apartment is laundry. No one ever looks forward to laundry but we don’t have any machines. It’s not ideal, but I guess I’ll have to lug my clothes up to the laundry mat and pay for it. Not only is the freedom I’m about to get going to be so worth it, but the rent is cheaper than paying for the dorms. This experience will definitely call for crazy memories and preparations for after graduation.